Digital skills and talent is one of four areas we focus on as part of the digital enterprise cross-industry theme. The other themes we examine are digital business models, digital operating models, and digital talent metrics. To make the challenge harder, organizations now have to recruit and operate with greater transparency. Peer-to-peer reviews allow more insights into the inner workings of an organization. Glassdoor, the fastest-growing jobs and recruiting website, alone has reviews about salaries, interviews, CEO and workplace for more than 435,000 companies. Employees, particularly millennials, do not want to work for organizations that are badly rated. Building a digital workforce goes beyond just recruitment and talent development – it also requires incumbents to think about enhancing their workforce in other ways. Enterprises can tap the gig economy for skilled on-demand workers, speeding up the process of finding and onboarding talent (see Figure 2). Also, companies that effectively integrate automated and artificial intelligence systems with human workers can boost productivity, with MIT estimating that there is an 85% reduction in workers’ idle time when they collaborate with robots. Attracting and retaining talent starts by listening to what employees are saying about a firm, both externally and internally, and to take these sentiments into account. Organizations consequently need to ensure they monitor relevant discussions on social platforms such as Twitter, Facebook, LinkedIn and Glassdoor. Referred employees have a longer tenure and higher job performance. ⁴ Enterprises, therefore, should focus on incentivizing their employees to use online networks to refer potential employees. Buffer is an application designed to manage social networks by providing the means for a user to schedule posts to Twitter, Facebook and LinkedIn at the same time. Buffer operates with complete transparency, an approach that has allowed it to attract high-quality talent across the world. Buffer received 2,886 applications for job openings when salary transparency showed up on its blog, compared to 1,263 in the 30 days beforehand. Formulate a multi-year workforce engagement strategy for millennials. Identify the places in the organization that will best suit their skills with digital technology. Build workspaces that attract ‘digital’ talent. Employees appreciate customized work experiences, created through tailored design of physical workspaces or virtual workplace policies. Create polices that support collaboration and knowledge sharing tools. Develop required competencies within the workforce. Mine the organization for hidden talent by regularly assessing employees’ competencies and match these with in-demand skills. 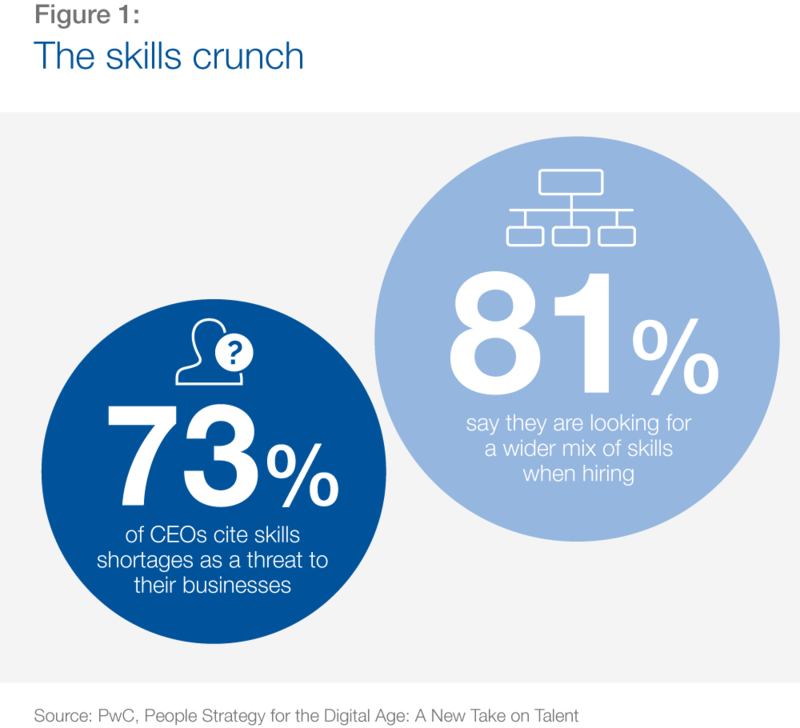 Bring new skills into the organization by hiring digital leaders and digital natives. Leaders need to hire people with digital mindsets and a willingness to challenge the status quo. Moreover, these individuals need to be placed across all levels of the organization to ensure real change. Organizations need to move away from a risk-averse mindset to one that accepts failures and encourages employees to take higher amounts of risks. For example, GE “enlisted 500 coaches to train executives to embrace concepts like risk taking and learning from failure.” ⁶ A possible way for organizations to facilitate change at the top is by creating technology immersion workshops or advisory committees for boards. Culture is the shared set of beliefs, values and mindsets that guide a group’s behaviors. It gives an enterprise a long-term competitive advantage because it is very difficult to copy. Some of the factors that set a digital company’s culture apart include a strong sense of purpose and a diverse high-quotient digital workforce. Communicate three times as much as necessary. Besides face-to-face conversations, consider all digital channels and focus on an honest and open conversation style. The leadership team needs to drive the cultural change. Leaders have to consider that the change needs to reach the ‘grassroots’ level. Leadership needs to release people’s creativity and apply lean startup methodologies such as hackathons and design thinking. Make changes visible. Create job aids and reference guides for the employees. Consider the use of semi-permanent visualizations, e.g., maps illustrating prominently the change journey. Continuous change monitoring. Use tools such as change tracking, culture/feedback surveys and performance monitoring. Companies must create a framework of functions and tasks that on-demand staff can undertake within the organization. The most effective way to recruit on-demand workers is through online talent platforms. This avoids costly transactions associated with onboarding, such as legal compliance, payroll taxes and pensions. Use the extended workforce to improve talent pool quality overall. It is critical to ensure a balance between legacy and on-demand staff. It also goes without saying that on-demand workers are not suitable for some roles, such as frontline police employees or those working in high-risk, safety-critical environments. Zappos, an online clothing retailer, believes that “the best ideas and decisions are made from the bottom up”. Soon, Tony Hsieh may not carry the title of CEO but become another employee with no title. Holacracy, a management structure based on the tasks a company needs to accomplish rather than a standard reporting structure, is at the core of Zappos culture.⁷ Other initiatives include empowering employees to deal with customers in the way they see best, giving them the freedom to let their personalities shine on Zappos’ Twitter account, and encouraging them to work remotely at coffee shops and co-working spaces. These aim to increase personal connections that will boost creativity. Rio Tinto is empowering its workforce with intelligent tools in its ‘mine of the future’. The initiative is improving safety, productivity, energy consumption and environmental impact. The mine of the future concept relies on people and computers working together, one augmenting the other, rather than viewing human and machine as mutually exclusive sources of knowledge. Workers are empowered to operate more effectively on the ground. Software interprets complex data sets and creates a user-friendly 3D display of a mine that is easily and quickly understood by their mining workforce.